METALLICA commemorated what would have Cliff Burton's 56th birthday by performing the song "Orion" during the band's February 10 concert in at the Pala Alpitour in Turin, Italy. Professionally filmed video footage of the performance can be seen below. The track, which appears on METALLICA's classic 1986 album "Master Of Puppers", was co-written by the band's late bassist, whose life was tragically cut short in a tour bus crash on September 27, 1986 12 miles north of Ljungby, Sweden. He was just 24. METALLICA drummer Lars Ulrich tweeted after the Turin show: "Threw in Orion tonight for Cliff.. the first time in almost a year. A very special moment. Thank you Turin for your generosity and warm vibes. ?? #wanna #metinturin #cliffburton"
Last week, Alameda County, California officially proclaimed February 10 to be "Cliff Burton Day" in the musician's honor. The proclamation came after METALLICA fans started a Change.org petition to recognize Burton in his hometown of Castro Valley. Burton was asked to join METALLICA in 1982 after the band saw him perform with his group at the time, TRAUMA. The bassist was not willing to move to Los Angeles, where METALLICA was based at the time, so they decided to move to the San Francisco area so that he would join. Burton played on METALLICA's first three studio albums — "Kill 'Em All", "Ride The Lightning" and "Master Of Puppets" — and co-wrote classic songs like "Ride The Lightning", "For Whom The Bell Tolls", "Fade To Black", "Creeping Death" and "Master Of Puppets". Burton's initial replacement in the group was Jason Newsted, who stayed in the lineup until 2001. 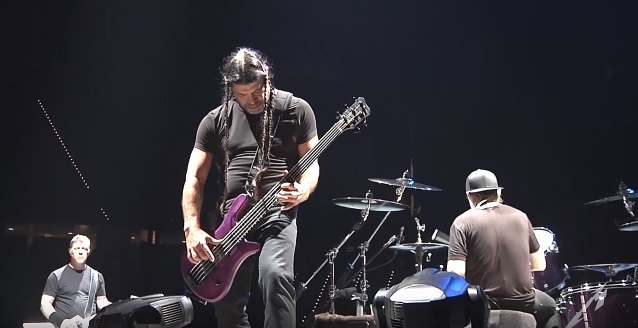 Robert Trujillo joined in 2003 and remains in the band to this day.